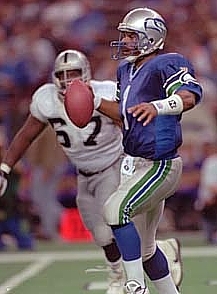 On March 7, 1997 QB Warren Moon agreed to a two-year, $1.65 million contract to join the Seattle Seahawks. The 40-year-old had also been considering the San Diego Chargers, which would have reunited him with Kevin Gilbride, the offensive coordinator for four seasons in Houston who had been hired as the new head coach of the Chargers. A return to the Oilers had also been a possibility, but the choice ultimately came down to Seattle and San Diego. 1997 was to be Moon’s 20th season in pro football, and signing with Seattle brought him back to the city where he had starred in college. He was MVP of the 1978 Rose Bowl while playing for the Huskies but, with pro teams still leery of black quarterbacks, went undrafted by the NFL and signed with the Edmonton Eskimos of the Canadian Football League. Moon had a spectacular career in the CFL, gradually taking over as starting quarterback from Tom Wilkinson and leading the team to five Grey Cup titles in six years. Along the way, he also had back-to-back 5000-yard passing seasons in 1982 and ’83 and received the Schenley Award as CFL Player of the Year and Jeff Nicklin Trophy as Western Player of the Year after the latter year. With no NFL team holding his draft rights, Moon had his choice of clubs to play for when he decided to return to the US in 1984 and signed with the Houston Oilers (after considering an offer from the Seahawks). In ten years with the Oilers, the last few spent in a pass-friendly run-and-shoot offense, Moon threw for 33,685 yards and 196 touchdowns and was selected to the Pro Bowl six straight times. Tough and a good leader with a strong arm and good mobility, he overcame a slow start in transitioning to the NFL to lead the Oilers to the playoffs for seven straight years. Still, his regular season success failed to translate into postseason glory as it had in the CFL. Houston never made it as far as the conference title game during any of Moon’s years there. Moving on to Minnesota in 1994, Moon passed for over 4000 yards in two straight seasons and added another 10,102 for his career over the course of three years, although injuries that included a severely sprained ankle limited him to eight games in ’96 and made him appear to finally be in decline. Moon, who turned 41 prior to the ’97 season, was all part of a transition of the Seahawks under new owner Paul Allen, who brought a commitment to spend more for talent that included LB Chad Allen, CB Willie Williams, and SS Bennie Blades as free agents along with Moon. He was to replace the disappointing Rick Mirer as backup to 30-year-old veteran John Friesz, who was entering his third year in Seattle. While tough and a good passer, Friesz was immobile and subject to injury, and it didn’t take long for him to suffer a season-ending injury when he went down with a broken right thumb in the season-opening game. Moon stepped in and proved to be a capable fit in Head Coach Dennis Erickson’s spread offense and set a new club record with 3678 passing yards while completing 59.3 percent of his passes with 25 touchdowns and 16 interceptions. Along the way, Moon had a five-touchdown, 409-yard passing performance in a win over the Raiders. He was named to his ninth Pro Bowl, while the club as a whole went 8-8. Moon came back for a second year with the Seahawks in 1998 that was far less successful, despite a 3-0 start. A rib injury caused the 21-year veteran quarterback’s performance to suffer and Jon Kitna, a veteran of the World League of American Football, took over on the way to another 8-8 finish. Moon threw for just 1632 yards with 11 TDs and 8 interceptions and, when Erickson was sent packing and replaced by Mike Holmgren, he was released. His stated desire to finish his career in Seattle failed to materialize as he moved on to a backup role with the Kansas City Chiefs for the final two seasons of his long and productive stint as a pro quarterback. With Seattle, he completed 458 of 786 passes (58.3 %) for 5310 yards with 36 touchdowns and 24 interceptions. These were just a small portion of his overall NFL totals of 3988 completions out of 6823 attempts for 49,325 yards, which all ranked third in league history at the time – especially impressive since he spent his first six years playing in Canada. His 291 TD passes ranked fourth. When his CFL numbers were added in, he had 5357 completions in 9205 attempts for 70,553 yards with 435 touchdowns against 310 interceptions. Warren Moon, whose accomplishments helped to break down barriers for African-American quarterbacks, was inducted into the Canadian Football Hall of Fame in 2001 and the Pro Football Hall of Fame in 2006 – the only player to be enshrined in both.